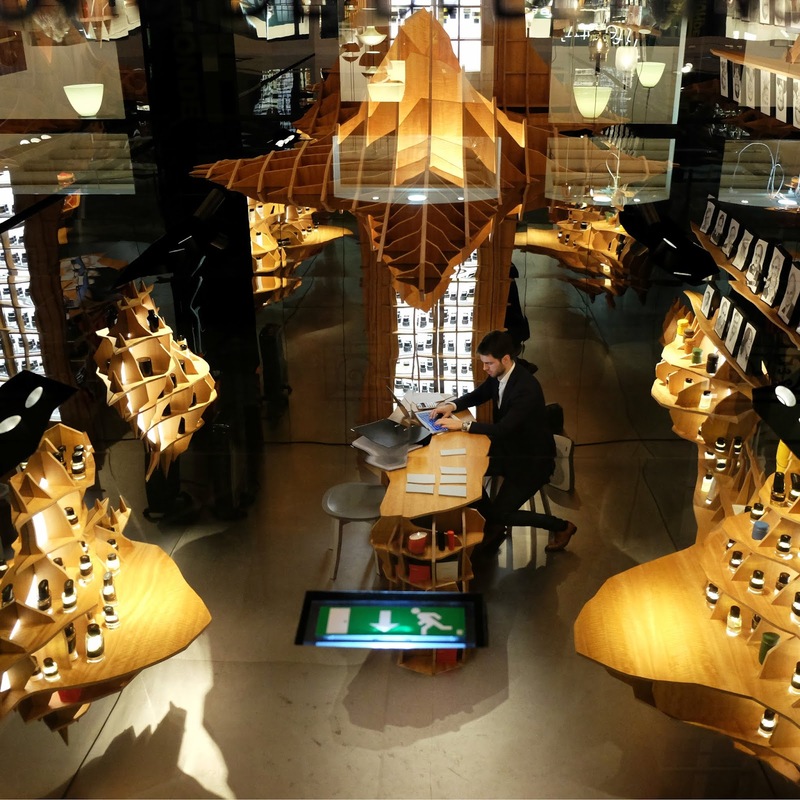 The man and his computer desk are actually reflections on the mirrored ceiling of a perfume shop. The wooden display cases are also reflections. You may or may not remember this photo from last year. This time I flipped it upside down for a different perspective. In reality, I aimed my camera upward, but now it looks as if I were looking down. ;-) You can see the original HERE. Well, this is not as mind-boggling as when it was upside down. Very nice indeed! I think there are reflections at the top which overlay the lampshdes but I can't figure those out. Flipping the photo gives a whole new perspective as it did not read well for me without your description. Ah, now I see it. What a great looking shop well worth the re-visit. Glad you added the original so we could see it as well Very good reflection James. Thaks for hosting and have a fabulous weekend. I love the wavy aspect - it's like a dream or in a pool of water. Cool reflection no matter which way is up! I am glad you linked to the earlier post since I missed it somehow. Wonderful reflections, James. I think you may have spent more time in Paris that I have. We love to be there but possibly we won't go again. The last time we were in France we skipped Paris as we were on a cruise that stopped at La Havre. I'm not sure what my favorite place is, we've been to most major stops. Most times we drove but sometimes took the train or ferry as our daughter lived in London for five years. I invite you to do a blog search for Paris but it won't do pages, only the first (my smart phone does them all). Mind-tripping image James - I do like your creativity with reflections! Nothing is what it looks like! Funny photo James. I agree with Sami this one works so well both ways, tres clever reflection. you are amazing! Your selections are so unique. I actually wonder every week what you will come up with this week. Thanks so much for sharing your reflections from all over the world and also for hosting us all in the long time lovely link up. cheers.